1 A None No Power Seat 1 A is a standard First Class seat however, the proximity to the lavatory and galley may be bothersome. 1 B None No Power Seat 1 B is a standard First Class seat however, the proximity to the lavatory and galley may be bothersome. 1 C None No Power Seat 1 C is a standard First Class seat however, the proximity to the lavatory and galley may be bothersome. 1 D None No Power Seat 1 D is a standard First Class seat however, the proximity to the lavatory and galley may be bothersome. 10 A None No Power Seat 10 A is a standard Delta Comfort+ seat. 10 B None No Power Seat 10 B is a standard Delta Comfort+ seat. 10 C None No Power Seat 10 C is a standard Delta Comfort+ seat. 10 D None No Power Seat 10 D is a standard Delta Comfort+ seat. 10 E None No Power Seat 10 E is a standard Delta Comfort+ seat. 10 F None No Power Seat 10 F is a standard Delta Comfort+ seat. 14 A None No Power Seat 14 A is a standard Economy Class seat that may have limited recline due to the exit row behind. Delta designates this seat as a Preferred Seat, which is reserved for Delta Medallion members. This seat may be selected by Medallion members at time of booking or afterwards. This seat becomes available to all passengers at time of check-in. 14 B None No Power Seat 14 B is a standard Economy Class seat that may have limited recline due to the exit row behind. 14 C None No Power Seat 14 C is a standard Economy Class seat that may have limited recline due to the exit row behind. Delta designates this seat as a Preferred Seat, which is reserved for Delta Medallion members. This seat may be selected by Medallion members at time of booking or afterwards. This seat becomes available to all passengers at time of check-in. 14 D None No Power Seat 14 D is a standard Economy Class seat that may have limited recline due to the exit row behind. Delta designates this seat as a Preferred Seat, which is reserved for Delta Medallion members. This seat may be selected by Medallion members at time of booking or afterwards. This seat becomes available to all passengers at time of check-in. 14 E None No Power Seat 14 E is a standard Economy Class seat that may have limited recline due to the exit row behind. 14 F None No Power Seat 14 F is a standard Economy Class seat that may have limited recline due to the exit row behind. Delta designates this seat as a Preferred Seat, which is reserved for Delta Medallion members. This seat may be selected by Medallion members at time of booking or afterwards. This seat becomes available to all passengers at time of check-in. 15 A None No Power Seat 15 A is a standard Economy Class seat that has extra legroom, however, there is no recline due to the exit. Delta designates this seat as a Preferred Seat, which is reserved for Delta Medallion members. This seat may be selected by Medallion members at time of booking or afterwards. This seat becomes available to all passengers at time of check-in. 15 B None No Power Seat 15 B is a standard Economy Class seat that has extra legroom, however, there is no recline due to the exit. Delta designates this seat as a Preferred Seat, which is reserved for Delta Medallion members. This seat may be selected by Medallion members at time of booking or afterwards. This seat becomes available to all passengers at time of check-in. 15 C None No Power Seat 15 C is a standard Economy Class seat that has extra legroom, however, there is no recline due to the exit. Delta designates this seat as a Preferred Seat, which is reserved for Delta Medallion members. This seat may be selected by Medallion members at time of booking or afterwards. This seat becomes available to all passengers at time of check-in. 15 D None No Power Seat 15 D is a standard Economy Class seat that has extra legroom, however, there is no recline due to the exit. Delta designates this seat as a Preferred Seat, which is reserved for Delta Medallion members. This seat may be selected by Medallion members at time of booking or afterwards. This seat becomes available to all passengers at time of check-in. 15 E None No Power Seat 15 E is a standard Economy Class seat that has extra legroom, however, there is no recline due to the exit. Delta designates this seat as a Preferred Seat, which is reserved for Delta Medallion members. This seat may be selected by Medallion members at time of booking or afterwards. This seat becomes available to all passengers at time of check-in. 15 F None No Power Seat 15 F is a standard Economy Class seat that has extra legroom, however, there is no recline due to the exit. Delta designates this seat as a Preferred Seat, which is reserved for Delta Medallion members. This seat may be selected by Medallion members at time of booking or afterwards. This seat becomes available to all passengers at time of check-in. 16 F None No Power Seat 16 F is a standard Economy Class seat. Delta designates this seat as a Preferred Seat, which is reserved for Delta Medallion members. This seat may be selected by Medallion members at time of booking or afterwards. This seat becomes available to all passengers at time of check-in. 28 C None No Power Seat 28 C is a standard Economy Class seat however, the proximity to the lavatories and galley may be bothersome. 28 D None No Power Seat 28 D is a standard Economy Class seat however, the proximity to the lavatories and galley may be bothersome. 29 A None No Power Seat 29 A is a standard Economy Class seat that is missing a window and has limited to no recline. The proximity of the lavatories and galley may be bothersome. 29 B None No Power Seat 29 B is a standard Economy Class seat that is missing a window and has limited to no recline. The proximity of the lavatories and galley may be bothersome. 29 C None No Power Seat 29 C is a standard Economy Class seat that is missing a window and has limited to no recline. The proximity of the lavatories and galley may be bothersome. 29 D None No Power Seat 29 D is a standard Economy Class seat that is missing a window and has limited to no recline. The proximity of the lavatories and galley may be bothersome. 29 E None No Power Seat 29 E is a standard Economy Class seat that is missing a window and has limited to no recline. The proximity of the lavatories and galley may be bothersome. 29 F None No Power Seat 29 F is a standard Economy Class seat that is missing a window and has limited to no recline. The proximity of the lavatories and galley may be bothersome. The A319 is used on a variety of short-haul routes. Delta Airlines offers Wi-Fi on all their Airbus A319 aircraft. We had 3 A&B from SLC-SJD and 2 A&B on the return. Although this is a smaller aircraft the seats were better than on the the CRJ, E, and MD aircraft of this size. A full 21" wide verses the 18.5-19 on those other aircraft. IFE selection was excellent as other reviewers have noted. Although only 2 entre choices available, both were above average and the FA's were top notch. Had the same crew on both flights. Would you believe choice of 106 movies! Totally upgraded interiors in Boeing 787 style, large overhead bins. Overall very comfortable seat, but as I'm 6'1" I would reconsider paying up for Comfort Plus or an exit row seat for a flight longer than 2 hours. Stay away from this row (13) Comfort + get to recline back to your already small space! Had a great experience! The seats provided plenty of room, were comfortable, and even provided IFE and USB charging. Was an incredibly comfortable trip from SEA to MKE. The four seats in Row 1 have LESS legroom than a Comfort seat!!! 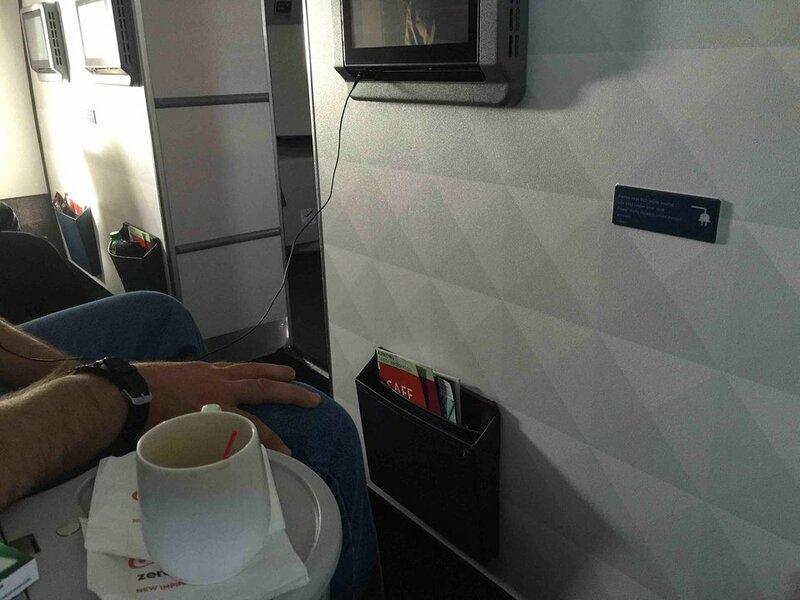 The unreasonable proximity to the bulkhead makes it impossible to stretch your legs out in front. I actually swapped my 1C seat with someone in Comfort for this reason. I do not consider row 1 to be worthy of First Class. I suggest adding a warning to this effect on your seat map. Great seat. You got to enter as one of the first, exit as one of the first. I was surprised to see the nice and new interiors of this airplane. Seats are fairly comfortable with a good amount of leg room for a short to medium flight. Nice seat. Fixed armrests; tray table and entertainment screen are in the armrest area. This seat is just behind first class and only separated by a curtain, so there is lots of leg room. Well-padded seat. I would sit here again in a heartbeat. The seat map on the delta site makes row 13 seem like it is a bulkhead seat (separate from the premium econ section) when in reality it's right behind the premium econ seats. I chose these because the delta map made it look like there weren't any seats directly in front of it but that was not the case. Great seat with tons of legroom and plenty of underseat storage for all 3 passengers. There are the standard seatback storage pockets, and an additional set of storage pockets attached to the side of the plane. This row has two windows and one of those has very good alignment with the seat and a good view of the engine. Tray table is in the armrest and a personal video monitor extends from its storage location under the seat below the right armrest. I did not use the video monitor and tended to hit my leg on it during the flight, but it was not an issue since I had plenty of room to extend my legs forward. As another commenter said, the row 10 seats are very uncomfortable. Each seat the entertainment screen folded down, which sticks out 3 inches and is is 4 inches wide. 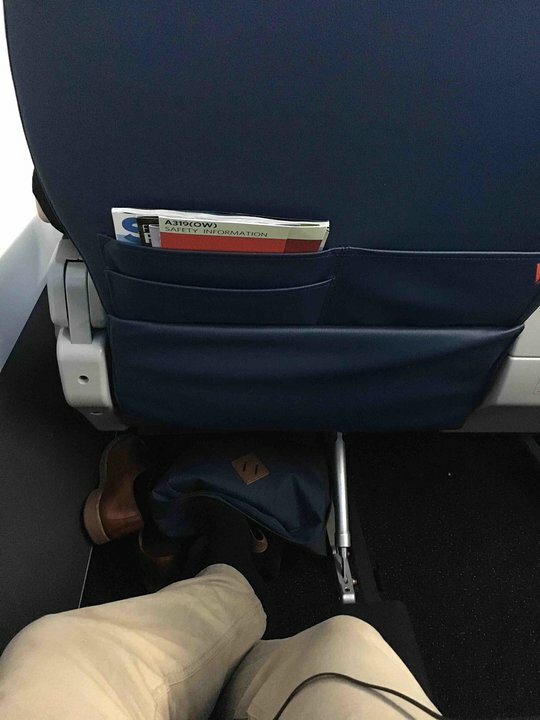 Unless you have very long legs, you cant site normal and have to squeeze you legs away unless you want a 6 inch long slab of metal to hit your leg the whole flight. The seats did not recline one centimeter! Although this was an exit row, the row behind was not, so the seats should have allowed for some recline. The entertainment system's screen is on a rotating arm that's housed under the seat. But it's not totally under the seat; it extends outwards several inches on one side of the seat. It's uncomfortable and makes it impossible to sit with your legs straight down on the floor in front of you. This appears to be true of all 6 seats in row 10. 10A was amazing. First in econ comfort plus (this is A319 v 2) and had mire legroom than first. And great position to rest head and sleep. The pitch is too short on these seats. It felt like the touch screens were right in front of your nose. Thankfully no one sat in front of me (a lot of empty Delta Comfort seats) because a reclining seat would have been intollerable. I upgraded to an exit row seat on the return flight to get some reasonable space. The seats lack sufficient padding and I had a back ache after each flight. Like others, I found the size of the bathrooms inhumane and their proximity to the galley not very sanitary. The plane on both of my flights was very cold and lots of people were asking for blankets. There is good overhead space and the plane feels very bright and airy, but would be better served with fewer rows and bathrooms for normal sized people. According to SeatGuru the row in front of this has no recline which makes this seat preferable compared to other seats in Economy. The touch screen monitors were good resolution with good responsiveness. Overall a nice plane. We had seats 2C and 2D from SLC to BNA. The updated A319's first class seating is excellent. Seats have adequate padding, and adjustable headrests with "wings" that make napping comfortable. The AVOD touch screens are in the seat back in front, are large, have good resolution, and are adjustable if the passenger in front reclines. Air vents worked very well. The overhead bins are the new pivoting type and are very large. The aisle on the A319 is wider than on the B737-800/900, and the forward lav is much larger than on the 737-800/900. The plane was very clean. Frankly, Delta's A319 is much more comfortable than its 737-800/900. The new interior was beautiful. Slimline seats were comfortable. AVOD excellent. My one negative is the lavatory. Since they refurbished the A319 the lavatory is so small you can't turn around to shut the door. My pant leg brushed up against the bowl, and I was left with fluid on my pants for the remainder of the flight. I paid extra for this seat only to find it doesn't recline!!! Shame on you Delta. One more inch would be wonderful. Overall this is a nice new airplane. I have now flown the A319 on Delta, United and American. Of the three Delta's is best. The seat bottom on United is kind of short. American's seat design with the video screen is horrible---the thing is right in your face. Delta also has a seat back video screen but of a FAR superior design. I am 6-3 and the pitch at 30" means my knees are right into the seat back in front. Connecting flight into ATL was an MD88 at 31" pitch and was allot better--even just one inch more. Of special note, the rear lavs are a joke! I have never seen one on a mainline airliner so narrow and cramped. I could barely get through the door. I also wondered if a flight attendant ever had to reach in and pull a rotund passenger out of there! Makes a funny visual and not that far-fetched. This seat was a great location. First row in Delta Comfort just behind Delta One. Lots of legroom and two windows next to the seat. Row 15 seats have far more legroom indeed being an exit row, but they DO NOT RECLINE either like row 14. This seat is very loud during takeoff & landing because of the engines. There is a very loud "air wooshing" sound that happens while the engines are on full throttle. AVOID rear bathrooms on this plane if you are average or larger sized! I can't believe how small and narrow the toilets are on this plane. The rear center bathroom I had trouble fitting through the door and forget sitting on the commode. Many other passengers were complaining to the flight attendant, not that they could do anything about this horrible design. Row 14 cannot recline due to the emergency exit row. Delta flies 1 versions of Airbus A319.